Snow has arrived in Kent and Medway and we’d like to help you keep safe if you’re heading out onto the roads this week – always ask yourself if the journey is necessary! We want you and your family to stay safe. Winter weather can be harsh, with driving conditions changing quickly with snow and ice, heavy rain and poor visibility on the roads. We’d like you to take extra care when planning your journey and adapt your driving style to suit the road conditions. Boots, warm clothes and blankets - for you and all passengers. First aid kit, reflective warning sign and high-visibility vest. Food and a warm drink in a thermos. Have you cleaned all windows and wing mirrors? Do you have enough screen wash? Clear any snow on the top of your car - breaking sharply could cause snow to slip down and obscure your view. Check exterior lights – are they clean and working? Allow for extra travelling time in tricky weather conditions, listen to weather forecasts. Ask yourself 'is the trip really necessary? Using dipped headlights in poor visibility. 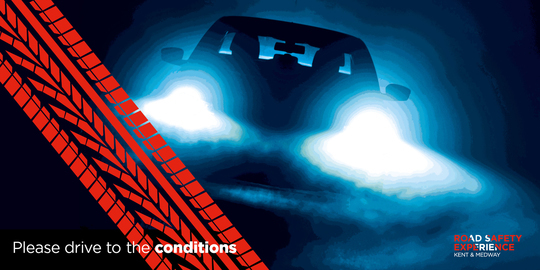 Driving slower compared to 'normal' driving conditions and keep a safe stopping distance behind the vehicle in front. Avoid distractions – especially your mobile phone. Avoid harsh braking, acceleration and steering. Keep a careful watch out for other road users especially motorcyclists, pedal cyclists and young pedestrians. If you get into trouble, try not to abandon your vehicle, stay with it until help arrives. Kent Fire and Rescue Service has an exciting centre to help young people stay safe on the roads. It’s called the Road Safety Experience and is free. If you have young people in your life, you can encourage their schools, colleges or community groups to book a visit. receive alerts at any time of the day or night.